An end joining technique where a hammer shaped tenon is set into a similar shaped recess. Often used in conjunction with wedges to pull the joint tight. The joints on this page have to a certain extent been replaced by metal bolt systems which when used with a system of jigs and templates are very quick to make and give positive tightening force. The generic term is handrail bolts, because they came to popularity in handrail use. 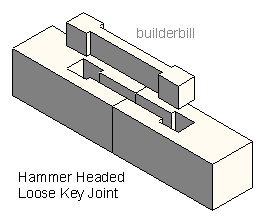 The hammer key system is nevertheless an excellent way to join pieces of timber end on. If I was in the business of making fine furniture I would go out of my way to use (and show) as many of these traditional joints as possible. 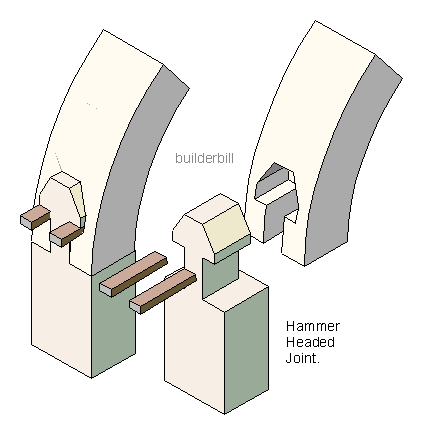 Above is the joint between a window or door jamb and it's curved head. If the timber used is hardwood, then this joint would be economical to use. If the timber to be used is softwood then it is suggested that a loose key be made out of hardwood similar to what is sketched alongside. The joints have to be carefully measured with allowance for the wedges and space at the ends of the keys for the joint to pull up tight with the wedges. Quite often these joints in wider timber also have short loose tongues or dowels inserted also to keep the joints flat and to stop twist.